The ‘Purbeck Explorer’ charters taking passengers to and from the Swanage Railway diesel gala will again be running this year, on May 10 and 13. Leaving Ealing Broadway at 1040 on May 10, Class 33 D6515 Lt Jenny Lewis RN will haul the London Underground 4TC to Swanage, with the charter calling at Kensington Olympia, Clapham Junction, Woking and Basingstoke en route to Swanage. The 4TC will then be in action at the diesel gala. The return on May 13 is provisionally booked to leave Corfe Castle at 1525, stopping at the same stations on the return. This time, the traction will be 20007 and 20142. Tickets for the charters are £39.50 in advance or £45 on the day. Attending the gala itself on May 11-13 will be the ‘20s’, 26007 from Barrow Hill, D7017 from the West Somerset Railway, 50049 Defiance from the Severn Valley Railway, and a GB Railfreight Class 66/7. More visiting locomotives will be announced, while resident Class 33s D6515 (33012) and 33111 will also be in action. Organiser Marcus Betts said that May 10 will feature a themed preview day with appropriate diesel and steam services, with details to be announced soon. He told RAIL that trains will run to and from Wareham with main line-registered traction, using the ‘20s’, 33012 and 50049. Traction will be mixed, but with four locomotives on the train. Eight trains per day will run to Wareham. 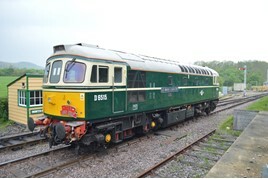 Betts said the main three-day gala will feature an intensive four-train diesel service operate between Wareham, Norden Park & Ride, Corfe Castle, Harmans Cross and Swanage from 0800 to midnight on May 11/12, and 0800 until 1900 on Sunday. The Dorset Beer Festival will be held at Corfe Castle. On May 11/12, the ‘Beerex’ will operate alongside 33111, running in push-pull mode with the 4TC. Traction for the Beerex trains has not been decided. Ticket prices for the main gala have not been announced, but Betts told RAIL that while prices are rising, day tickets will remain under £30.